This past weekend at Charlotte Motor Speedway, the Array team was able to effectively execute a social and event ‘activation’ strategy for our client, Winston Products, because we capitalized on NASCAR’s ability to draw a large number of key consumers in one place. The Winston team activates at several NASCAR events a year with their brands SmartStraps and TowSmart. So what does it mean, “to activate”? Taking a service or product to an event that draws that service or product’s demographic group to create value is activation. So, what does it mean to “create value”? Different marketers can interpret value differently. Generally we consider value as new or additional sales and increased brand awareness. The original activation is the trade show display, but for the past 10-15 years marketers have placed greater emphasis on large draw events like motorsports, professional football games and endurance competitions (like marathons and Tough Mudder events). For retail products and services that require promotions beyond the traditional, event activations can be a fantastic way to engage new consumers and reinforce loyalty of existing customers. The key to any activation is two-fold: preplanning and post event follow-up. Without either, event activations will not deliver value. In other words, it takes more than an elaborate display or a pretty spokesperson to deliver results! Up until recently, it has been difficult to provide results with hard data. For years the best way of proving success was to collect names and addresses, then follow-up with a direct marketing campaign. These campaigns typically provided incentive for customers to buy in retail. But without proof of customer commitment to buy, those looking for clear results were left less than convinced. Thanks to social technologies this is no longer an issue, as click-throughs and site visits are automatically tracked by social media and marketing software. Our goal for the Bank of America 500 Race was to first create and execute an event that draws interest. Second, to develop a plan that would allow for social engagement. Third, integrate a cross channel marketing campaign. And finally, create a follow up strategy that both drives consumers to retail and incentivizes those same consumers to share their experience with family and friends. 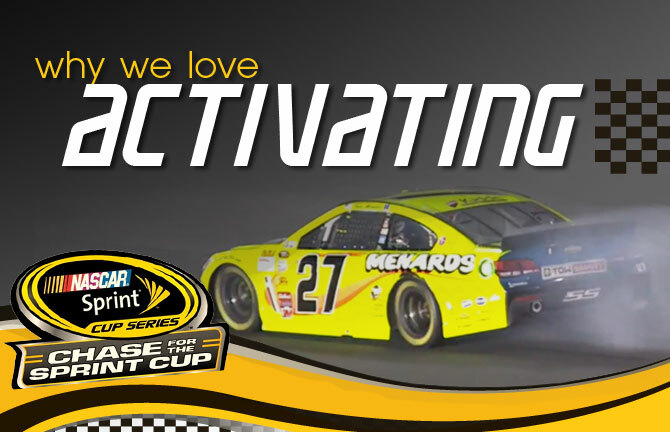 Having dedicated, hard-working partners like Charlotte Motor Speedway, NASCAR, RCR Racing and Menards is a must in making sure we successfully hit the mark with our event each and every time we activate!